Protest marches bring people together and create mobile places that subvert many people's quotidian uses of streets. I ride a bike, so I'm in the street quite often, but is that the case for most people at a protest? And even if we're accustomed to being in the street, we're not usually in a dense crowd of bodies, which feels a lot more exciting than being in a dense crowd of vehicles. So often, though, this placemaking feature gets overlooked because protests primarily aim to make political statements that don't hinge upon the experience of the protest space. Protests carry a shadow, referencing earlier spectacles from other movements and times. 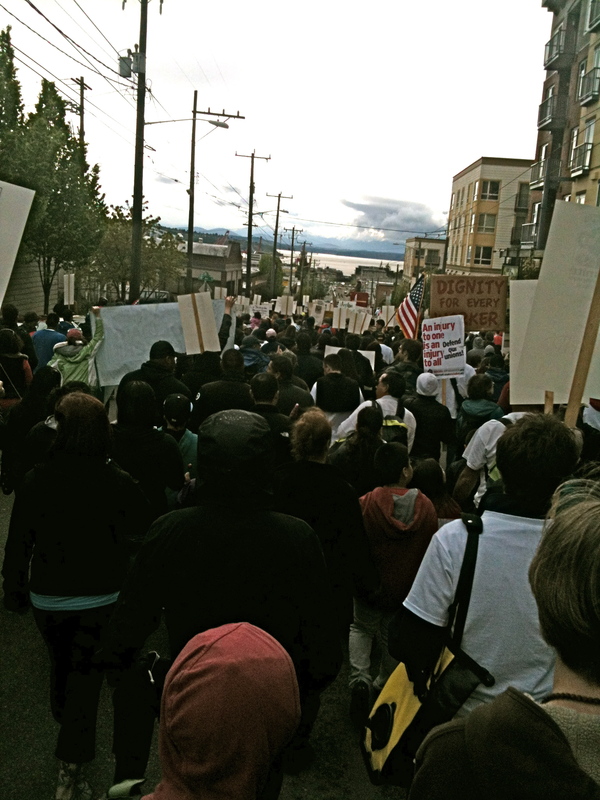 On Tuesday, I marched in a Seattle May Day demonstration organized by El Comité Pro-Reforma Migratoria y Justicia Social, an immigrant advocacy and labor rights group that has been facilitating this march for 13 years. It had been an odd day; the local Occupy movement had held its own march downtown, which had devolved into some petty vandalism that the media gorged upon like hungry houseflies. Around town for the last month, I'd seen signs connecting Occupy Seattle's plans with the legacy of the 1999 WTO protests in Seattle. I remember reading about those protests as a teenager, sitting in front of a computer in Southern California. In those days, my head was filled with Rage Against the Machine and the EZLN, and the WTO uprising gave me a restless feeling I didn't understand until later when I actually started participating in marches. It was the feeling of wanting to join a crowd, join a chant, get overwhelmed by the adrenaline that gushes into your bloodstream when you add your voice to a chorus of "el pueblo unido, jamás será vencido." But instead of acting out my teenage fantasy, there I was sitting in a coffee shop in Capitol Hill, reading Twitter updates about the "riot" developing downtown and thinking about the march I planned to attend in a few hours. Was Twentysomething Adonia going to let Teenage Adonia down by foregoing the potential excitement of the downtown march for the family-oriented calm of the more established march? I have grown skeptical of the nostalgia that seems to fuel some participation in protests at the same time that I have become attentive to the visceral feeling of being part of a temporary something that moves and fills the street with feet, banners, strollers, megaphones. I didn't break any glass on Tuesday, but I did get that adrenaline rush as I marched down Jackson Street in a crowd of thousands. Many, many police waited around as a rally finished in Judkins Park and people lined up for the march to begin. As we started to move, I wished I had a noisemaker. Chants were starting up at various places in the sea of people, and I joined in when people around me got going. It wasn't until we passed under I-5 on Jackson, though, that I started to feel it happening. I don't really know how to explain the feeling that comes over me when I am in a protest space. It is like a pressure on my eyes that makes them water, I draw ragged breaths and look down so nobody can see the tears. I think it is a feeling of connection with something larger, or at least of being overwhelmed by the sounds, ideas, realities people create when they come together.